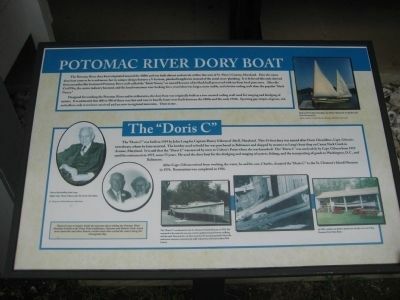 The Potomac River dory boat originated around the 1880s and was built almost exclusively within this area of St. Mary's County, Maryland. 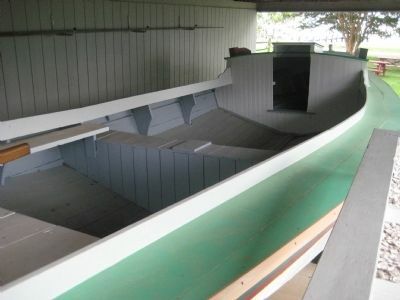 How the name dory boat came to be is unknown, but its unique design features a V-bottom, planked lengthwise instead of the usual cross-planking. It is believed this style derived from an earlier flat-bottomed Potomac River craft called the "black Nancy," so named because of its black hull preserved with tar from local pine trees. After the Civil War, the oyster industry boomed, and the local watermen were looking for a vessel that was larger, more stable, and a better sailing craft than the popular "black Nancy." Designed for working the Potomac River and its tributaries, the dory boat was originally built as a two-masted sailing craft used for tonging and dredging of oysters. It is estimated that 400 to 500 of these very fast and easy to handle boats were built between the 1880s and the early 1930s. Sporting gay stripes of green, red, and yellow, only seven have survived and are now in regional museums. Ours is one. The "Doris C" was built in 1919 by John Long for Captain Henry Gibson of Abell, Maryland. 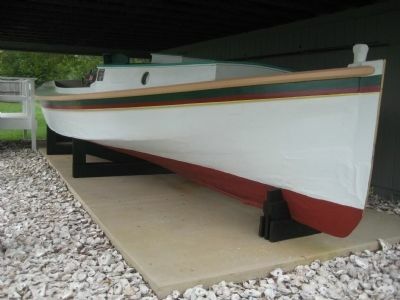 This 34-foot dory was named after Doris Cheseldine, Capt. Gibson's sweetheart, whom he later married. The lumber used to build her was purchased in Baltimore and shipped by steamer to Long's boat shop on Canoe Neck Creek in Avenue, Maryland. It is said that the "Doris C" was moved by oxen to Colton's Point where she was launched. The "Doris C" was used solely by Capt. Gibson from 1919 until his retirement in 1975, some 55 years. He used the dory boat for the dredging and tonging of oysters, fishing, and the transporting of goods to Washington, D.C., and Baltimore. After Capt. Gibson retired from working the water, he and his son, Charles, donated the "Doris C" to the St. Clement's Island Museum in 1976. Restoration was completed in 1986. 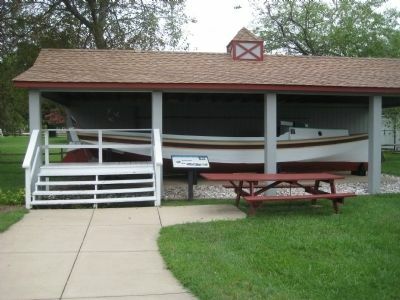 In 1989, a shelter was built to protect one of only seven surviving Potomac River Dory Boats. Location. 38° 13.493′ N, 76° 45.023′ W. Marker is in Coltons Point, Maryland, in St. Mary's County. Marker is on Point Breeze Road 0.2 miles east of Colton Point Road (Maryland Route 242), on the left when traveling east. Touch for map. Marker is in this post office area: Coltons Point MD 20626, United States of America. Touch for directions. Other nearby markers. At least 8 other markers are within 2 miles of this marker, measured as the crow flies. St. Clements Manor (within shouting distance of this marker); Saint Clement’s Island (within shouting distance of this marker); St. Clement's Island Lighthouse (within shouting distance of this marker); Mother of Light Shrine (within shouting distance of this marker); Welcome to St. Clement's Island (approx. 0.8 miles away); Maryland Began Here! (approx. 0.9 miles away); The Shrinking Island (approx. 1.2 miles away); St. Clement's Island (approx. 1.2 miles away). Touch for a list and map of all markers in Coltons Point. More. Search the internet for Potomac River Dory Boat. Credits. This page was last revised on June 16, 2016. This page originally submitted on September 4, 2009, by F. Robby of Baltimore, Maryland. This page has been viewed 2,948 times since then and 19 times this year. Photos: 1, 2, 3, 4. submitted on September 4, 2009, by F. Robby of Baltimore, Maryland.